This evening was stunningly gorgeous. Unfortunately I was in a hurry to get down to Lodi (Stockton? the borderline thereof?) for a dance rehearsal so I really only got to enjoy it very briefly out the windshield of the Taurus. The sun was setting, so the light was coming in sideways all gold and pink, the clouds overhead were deep blue and it was raining, and there was a double rainbow off to the east. Wow!!! I generally don't think of myself as superstitious but at the same time I catch myself finding "signs" everywhere (usually in places I shouldn't, like hearing my all time favorite song while going to pick someone up from the airport and thinking that the stars are all aligning for me or something dumb like that). But really, this was jaw-dropping, I couldn't help but feel like it's a good omen for things to come. No pics, I neglected my own rule this evening ("Always carry a camera"). I've decided to go to Fresno. Last show of the season for sure, and it'll be day trip, so that's one looooong day. I still have no idea what to do about the birds. There are a lot of options. So about the 30-30-30 project, what can I say. It was interesting, I definitely used some techniques I don't normally use and drew some things I don't normally draw, and that's all good. It was a good exercise. I was a little tired of it by the end, mostly because there are a lot of other things I ought to be focusing on, but also I didn't realize how hard it would be to come up with something every day! I don't plan to do it again. I also didn't expect it to become quite so personal, I was just going to be drawing random items, but sometimes even random items end up with some sort of deeper meaning. Oh well, you can't really predict those things in life anyway (or, actually, yes you can, but I won't get into that). That's all okay now, for anyone wondering. I've even got one foot in the stirrup. ;-) Hmm! Anyhoo, here's a pic of all the 30-30-30's together. I'll start shipping them out on Friday, fyi to those of you have ordered (unless I'm still waiting for your moolah). 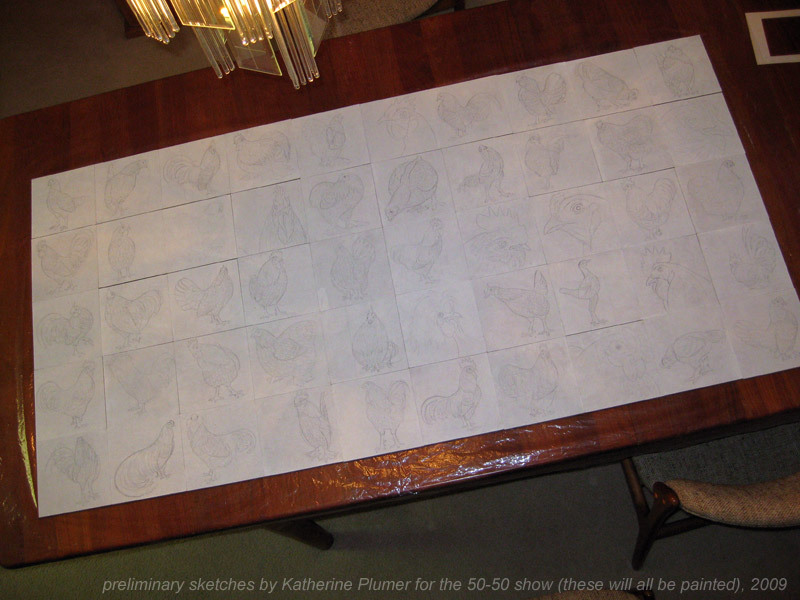 After about a gazillion hours I have finally finished sketching all the chickens for the 50-50 show. Yes, this is the thing where I'm theoretically supposed to be doing one a day but decided to sketch ALL of them and then paint a few a day. We'll see if that saves me any angst. That's a lot of chickens, let me just say right now. This has the potential to cure me of ever wanting to make chicken art again. ;-) I know this doesn't show up very well, and it was hard to photograph. 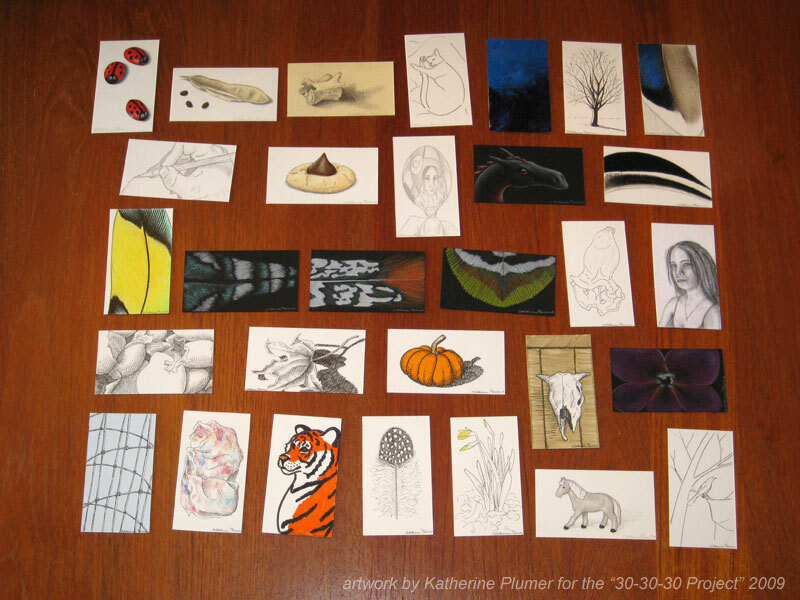 Each of these is 6x6 inches, so the whole group together like this is 2.5 by 5 feet. I was up on a chair with the camera over my head! Oh! I've been talking to a bunch of knifemakers lately, since I find myself wanting to focus on working on knives (scrimshaw for now, engraving when I am more comfortable with it, and I REALLY need to study scrolls and work on that). Of course nothing is ever for sure until it's here in my hands, but there might be a collaborative project in the works for this summer, and I've been in touch with a collector who is interested in having me work on a piece this fall. And another knifemaker is going to send me a knife that I can scrim "on spec." Not my favorite way to work, but the focus of that would be getting it published, so I'd really give it my all and do the most fantastic image I can come up with. I'm happy about the rain, we need it. Plus it's always a good excuse to wear flannel and drink hot chocolate.